Amidst the tulips, tourists, and perfectly landscaped government spaces of Ottawa, lives an understated yet growing independent arts scene. Though sometimes hard to spot for those casually passing through, this scene — rife with small galleries, film collectives, indie music shows, and festivals — has helped to transform the side streets of the nation’s capital into a marketplace of exceptionally interesting artistic diversions. Now a new and promising festival will soon add to this mix. This June, the inaugural Asinabka Film and Media Arts Festival promises seven days of events teeming with Indigenous-focused film screenings, visual and media art, gallery crawls, and music. Taking its inspiration from similar gatherings like Toronto’s imagineNATIVE Film + Media Arts Festival and Peterborough’s Ode’min Giizis, Asinabka enjoys support from the local film and Aboriginal communities in Ottawa’s downtown core. 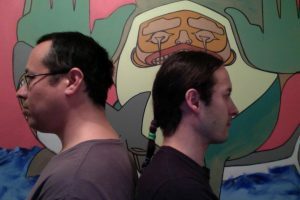 MEDIA INDIGENA’s Kerry Potts recently sat down with Asinabka Co-Directors Howard Adler and Chris Wong to talk about their aspirations for the festival and how they intend to carve out a unique, Aboriginal art space amongst the tulips. MI: Tell me about your vision for starting this festival. Howard Adler (HA): We were hanging out last summer a lot, and we were doing a weekly meeting up on Victoria Island practicing the language. We started talking about starting an arts festival, and then we realized there’s already an arts fest called The Solstice Fest here. So, we thought about what our own creative interests are with film, and that there isn’t an Indigenous film festival here in the Nation’s Capital, so that was our rationale. It all started on the island. MI: Where does “Asinabka” come from? HA: The festival takes its name from Victoria Island and Chaudière Falls. Traditionally these areas are called Asinabka. William Commanda, an Algonquin leader, helped to keep the area a sacred gathering place. We wanted to keep his vision going by using the space and by reinforcing the use of the name as one of the original names for Ottawa. It was a place you’d stop when coming into Ottawa. We kind of want to bring that history back to life. MI: How do you plan on carving out a space for Aboriginal film amidst a city whose art scene tends to lean toward the mainstream and tourist industry? Chris Wong (CW): By having the name of the festival of Asinabka, we’re reclaiming that space. We’re pointing to a sacred space that exists here 365 days a year. The festival will encourage Indigenous and non-Indigenous people to explore Aboriginal cultures, get involved in the festival’s activities, and get people to think about this space as an Indigenous artistic space. They’ll look at Indigenous people as not just relics of the past, but as living a modern life in a modern city, and have people reflect on that. Also, we’ll bring in that sort of vibe to cultural institutions, where Indigenous and non-Indigenous people can mingle, interact, share stories and ideas with each other. You look at Canada and Ottawa as French and English primarily, but we want to encourage Indigenous filmmaking in the language, and get people involved in the culture both through history and in modern life. MI: What kind of work can people expect to see at Asinabka this June? HA: Thematically, we are programming work that deals with Indigenous topics and issues. We’re accepting work by both Aboriginal and non-Aboriginal people. Though 99% of our submissions are by Aboriginal artists. We also don’t want to exclude Aboriginal people who are talking about other topics not conventionally deemed “Aboriginal” too. We’re trying to balance taking about Indigenous themes and allowing people to talk about other topics. We’re trying to have our cake and eat it too. MI: Who are some artists that are really blowing your minds right now? CW: Ben Powless is an activist and photographer. He’s been travelling the world fighting for Indigenous rights, from the tar sands to the Amazon. He was in Peru traveling through the Amazon when there was a massacre in a native village. He was invited to take pictures of the aftermath. We’ll be showing these works at the festival, and hope to pin him down for what will be a really inspiring artist talk. Another amazing guy is Ottawa’s own Bear Witness. Bear and I go back about 20 years to the Native Friendship Centre. We were part of a youth council and went to the Gathering of Nations powwow in Albuquerque, New Mexico. We went to this 2500 year old native city on top of a Mesa that has been continuously occupied as a native town since before Jesus Christ. Bear is a video artist and DJ who has been really blowing up with A Tribe Called Red. That crew has been touring all over Canada and the USA with their video and DJ mash-up set, ‘Electric Pow-Wow,’ that has a distinctly urban and Indigenous flavor. HA: I also love Native Visual Productions out of Toronto, who fuse graffiti with woodland style art. They’ve done live painting with Broken Social Scene and Drake. Their thing is indigenizing urban spaces. They’ll be doing live-painting performance along with live DJs. It’s going to be amazing. MI: What makes Aboriginal film distinct from mainstream film, or is there a distinction? HA: I don’t necessarily think there has to be a distinction. It’s a voice, or voices, that are distinct and different from other people’s voices. If you highlight Indigenous voices in Canada, you’re going to get different stories. MI: In recent years, festivals like Sundance have moved away from their Aboriginal-specific programs and now make Aboriginal films part of the larger festival. Why do you feel the need for a distinctly Aboriginal fest? HA: We need this Aboriginal-focused festival, particularly in the nation’s capital, where decisions are made about us, as Native people, for us. There are so many people who might be in charge and making decisions who have no experience with First Nations, Métis or Inuit in Canada. It’s kind of appalling that people can be making these decisions without any connection to the people they are managing. We have an opportunity to show these stories from an Aboriginal perspective. Out of any place in Canada, this is one of the most important places to have this perspective shared. Just because we have an Aboriginal film festival here, that shouldn’t make other festivals, like the Inside Out Festival, think they don’t have to program anything Indigenous. We don’t want to ghettoize Aboriginal art, but I think there really is a need to focus on it. I think other festivals should focus on it too. MI: Any recommendations for “must see” film and events this year? HA: Everything! Our opening event is going to be a cultural gathering with an outdoor screening. We’re also screening the Ottawa premiere of an excellent film called Smoke Traders that just screened at Hot Docs. It investigates whether the tobacco trade in the Aboriginal community is an act of sovereignty or criminal activity. The imagineNATIVE program is going to be a big draw. A lot of people don’t travel from Ottawa to Toronto in October for their festival, so bringing imagineNATIVE here is a big thing. Finally, Thursday June 21 is going to be a Gallery Crawl, that’s going to be a not-to-miss event with visual, media art and performance, as well as a DJ crew. We’ll be moving from a bourgeois, wine and cheese space (Gallery 101), to Fall Down Gallery, a more lowbrow, beer and bannock type of space. We just want to show how accessible art can be. MI: What will “success” be to you this year? The 1st annual Asinabka Film and Media Arts Festival will take place June 18-24 at various venues across Ottawa, including Victoria Island, Mayfair Theatre, Gallery 101, Fall Down Gallery, The National Archives, The National Gallery, Museum of Civilization, and Club SAW. For more information visit www.asinabkafestival.org.